The Meg is still months away from being released, but a new image from the movie is here to make sure you think of giant sharks every time you step foot into the ocean this summer. The movie stars Jason Statham and the actor has just revealed that he went diving with huge bull sharks to prepare for his role in The Meg. While the bull sharks have nothing on the Meg when it comes to size, it's still a pretty intense experience, according to Statham, but not in the way that you'd expect. 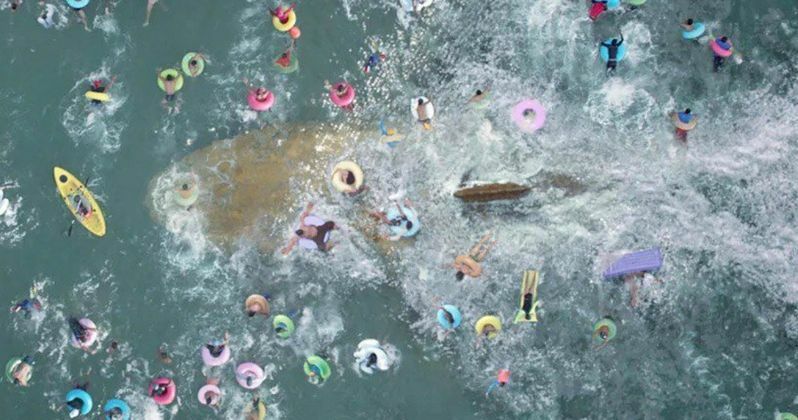 In the recently released image from The Meg, hundreds of people are floating in the ocean, unaware that there's a giant prehistoric shark swimming right below them. The 75-foot Megalodon looks like it's about to have a nice snack on some unsuspecting tourists. The first trailer for the movie is expected this month, along with the poster. The Meg author, Steve Alten, says that two trailers are complete and that they're excellent. He also revealed that there hasn't been any footage released yet because the studio doesn't want the trailers to be released too far ahead of the release of the movie. In a new interview promoting The Meg, Jason Statham was asked about his preparation for the role. The Fast and Furious actor admitted to going to Fiji to swim with 20 to 30 huge bull sharks while they were being fed tuna heads. Statham recommends that everybody take the chance to swim with sharks if they can. He had this to say. "On the early stages of the prep, we took a trip to Fiji, and we went diving with some bull sharks. They hand-feed them and it's a spectacular thing to see. These things are three meters in length, huge big things. There were 20 or 30 of these things, and they were hand-feeding (them) big tuna heads, and we got very, very close, and it was a spectacular moment. To swim in close proximity to a big, three-meter shark, is to be recommended to all and everyone." When asked if he was scared to go diving with the bull sharks, Jason Statham revealed that he was initially anxious and nervous on the boat beforehand. However, the actor says that all of his anxiety disappeared once he got into the water and into the natural habitat of the sharks. Statham also noted that he is a huge fan of SCUBA diving. He had this to say. "You know, it's funny, because you get anxiety when you're on the boat. But once you get in the ocean, things take a very different turn. You get very relaxed, and when you're in their environment, it's quite a tranquil sort of thing, the anxiety goes away completely. It's remarkable to experience. All of the fear, or the perceived fear, is done in your own head before you get down there with them. Once you're swimming down there with all the other divers, it's phenomenal. It's one of the greatest experiences you could have, for me anyway. I'm a big SCUBA diver fanatic. Wherever I am in the world, if I get a chance to get in the ocean, I do." In addition to Jason Statham, The Meg also stars Winston Chao, Li Bingbing, Rainn Wilson, Ruby Rose, Page Kennedy, Jessica McNamee, Ólafur Darri Ólafsson, Robert Taylor, Cliff Curtis, Shuya Sophia Cai, and Masi Oka. The first trailer for the movie will be released this month along with a poster. The Meg hits theaters on August 10th, just in time for Shark Week. You can check out the brand-new image from the movie below, provided by Entertainment Weekly.